1. Create a new MVC web application. 2. Delete everything out of the project other than the web.config. 4. Now, add an F# class library project to the solution. Call it "FunctionalWeb.Framework". 6. 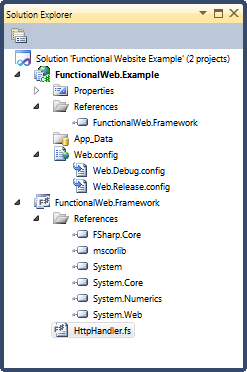 Add a reference in the F# class library to System.Web. 7. Rename Module1.fs to HttpHandler.fs. 9. Add a reference to FunctionalWeb.Framework in your web project. As long as you allowed Visual Studio to modify the web.config in order to allow debugging, you should be able to put a breakpoint in your F# HttpHandler file, and have Visual Studio hit the breakpoint. Congrats! You've just gotten started building your own HttpHandler with F#.